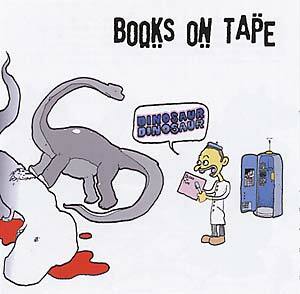 "Dinosaur Dinosaur is the latest release by Los Angeles based Books On Tape, Todd Drootin's project dedicated to the style he terms 'beatpunk.' The tag is definitely apt as Drootin has gained a reputation for fusing hip hop and electronic beats with the energy and mayhem of punk rock. Dinosaur Dinosaur further cements this style by incorporating more of the rock spirit of his animated live performances. Listening to Dinosaur Dinosaur one may be reminded of other renowned sonic manipulators such as Kid 606, Venetian Snares, DJ Rupture, and 1 Speed Bike. Within 14 cuts Drootin incorporates a myriad of stylistic shifts over a foundation of unorthodox grooves."